Integration pattern in breeding cows, for example within a plantation, has tremendous potential, sustainable and economical because it can produce local feeder cows that are cheaper than imported ones. The beef cattle breeding business is the main source of supply of feeder cows for fattening business. Although there are many private sector businessmen in Indonesia who has been dealing with this cattle breeding, they still consider it as less than profitable. Thus, there are more smallholder farms in this segment. People’s Farm Center Group Mega Jaya (SPR Mega Jaya) in Bojonegoro Regency, East Java, for example, prefers to do cattle breeding to fattening. One of the reasons is because the majority of the people in their area only have the capacity to breed cows that were inherited from generation to generation with the livestock farming system. “As of now, around 90 percent of the cow population that belong to the group are meant for breeding. In the future, we targeted 30 percent of feeder cattle produced will be for fattening,” Darwanto, the Head of SPR Mega Jaya, told TROBOS Livestock. The abundance of cow feed and human resources that are capable in running the breeding business are the driving factors to further develop this business. “This cattle breeding business doesn’t need special treatment to be developed, so people don’t need extra effort to raise the cows,” he explained. The Cattle Production Cooperatives (KPT) Maju Sejahtera in Tanjung Sari District, South Lampung Regency, Lampung, also chose the cattle breeding business over fattening as future investment. “If all our farmers have cows then Indonesia don’t need to import feeder cows anymore,” said the Head of KPT Maju Sejahtera, Suhadi. The cooperatives’ breeding program goes hand in hand with the South Lampung Regency Government’s program that has appointed Tanjungsari District as the area for Ongole cattle germplasm preservation and development. Various production management models are being developed in this cattle breeding business. At SPR Mega Jaya, they applied the communal cowshed model, with 250 heifers, bulls and calves in a 4,000 sqm cage. “To expand the business of breeding beef cattle, we’ve been doing this communal shed since the farmers’ group was first established, until now. So that we can easily monitor the cows during selling,” said Darwanto. Other than communal cowshed, members of the group have partners whose sheds are located in several areas in Ngantru Hamlet, Sekaran Village in Bojonegoro Regency. They raise the cows under one management for a group’s cowshed and each member was given the assignment to care and be responsible for the cows. “Every member is told to focus on the beef cattle breeding business and developing a small enterprise by making crafts from waste,” he said. Darwanto said that their cattle breeding business had been running even before the group formed SPR in 2015. In 2015, the cows’ population only consisted of 20 Ongole heifers. In 2017, SPR Mega Jaya expanded their breeding business by adding 100 Brahman Cross (BX) heifers and 5 bulls with the aid from Indonesia-Australia Commercial Cattle Breeding (IACCB) program. After that, they produced 75 BX calves in the first year, and 17 calves in the second year of the program. “Currently, the total population of beef cattle in our group is 430 cows for 118 farmers, so there are 2 to 4 cows for each farmer,” Darwanto added. Meanwhile, at KPT Maju Sejahtera there are 38 farmers’ groups in Tanjung Sari District and 4 farmers’ group in Tanjung Bintang District. Their cattle population is around 2,885 cows with 730 heads of household and ownership scale of 2 to 3 cows. All of them focus on cattle breeding business. Almost 90 percent of the cattle raised in Tanjung Sari district are Ongole cattle, and the remaining 10 percent other breeds of cattle such as Limousine, Simmental and Balinese. In 2017, KPT Maju Sejahtera started cooperating with IACCB program and learned about commercially breeding the BX. “From the initial population of BX cows, 100 heifers and 5 bulls, now we have 211 cows, which consist of heifers, bulls and calves,” said Suhadi. 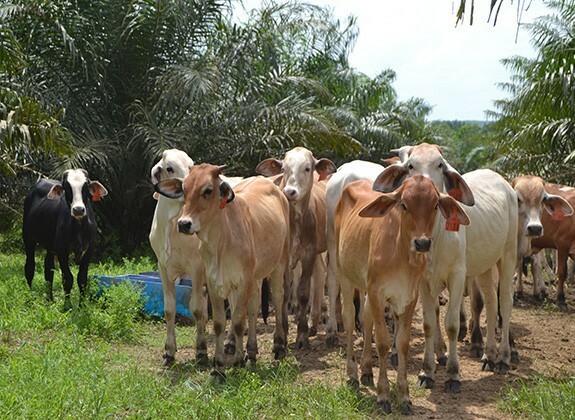 Not only SPR Mega Jaya and KPT Maju Sejahtera, Farmers Owned Enterprise PT Cahaya Abadi Petani (BUMP PT CAP) in Martapura, Banjar Regency, South Kalimantan, also focuses on cattle breeding. The enterprise, established by Salafiyah Usluhuddin Islamic School Foundation, is a partnership between farmers (students/students’ parents) and the government to empower farmers. The Islamic school has several farming activities, such as planting vegetables, rubber plantation, breeding Broilers chicken and beef cattle. These programs were made so that the students would be able to continue and become entrepreneurs in agriculture once they finish school, because not every students could be a kyai or Islamic scholar. “The students here are mostly children of farmers, so we hope that when they graduate from the pesantren (school) they will have the skills according to their interests,” said the BUMP PT CAP Director, Muhammad Husni Thamrin. To achieve the goal of having independent graduates, the students were assigned to help manage 111 BX cattle breeding since August 2017. “So they can develop, the management skill of the farmers must be modified so they can run the business from the beginning until the end,” he added. The BUMP PT CAP is developing a semi-intensive beef cattle breeding model. In the morning, all cows are released to graze on the pasture within a 500-hectare area, 300-hectare has been allocated for their cattle project in the hope that natural inseminations would occur. After that, in the afternoon, the cows are put back in the shed. “The ratio between male and female is 1:20. We hope with natural insemination, 1 female can produce 1 calf in a year,” said a student and a facilitator for BUMP PT CAP, Akhmad Hamdan. In raising them, the cows are handled well and students pay attention to the welfare aspects of the cows so they will not be stressed. To observe the cows’ condition, they do performance test when the cows stand up and measure them based on Body Condition Score (BCS). Ideally, for a cow, their BCS should be 3.00-3.50. “We always pay attention to the aspects of calf handling with extra care for their mother, helping the calves, giving them green feed, as well as examination and medication for the cattle by doing anamnesis for past diseases,” he said. Moreover, another aspect that they consider important is to always control the cattle nutrition by planting grass in the pasture using natural and high quality grass to increase the quality of their cow feed. They also give extra greenery in the cowshed with Napier grass, Brachiaria decumbent, Nepalese grass, Gliricidia and legumes. Concentrate made of palm kernel meal, powdered rice hulls and mineral mixture is also given to the cows. Based on Akhmad’s experience, the production cost for breeding per cow per day is around Rp 2,900 for the cost of feed (green and concentrate) and healthcare cost of around Rp 400. Meanwhile, operational cost which covers infrastructure, workers, and administrative fee is around Rp 3,000 per cow per day. The cost of pasture which consists of planting, building and maintaining, is around Rp 750 per cow per day. Akhmad admitted, breeding cattle with semi-intensive grazing system has its challenges during drought because the supply of food can be reduced. “During the rainy season, we have no problem with grass supply. Naturally, the cattle know better which food is good for them. Wild grass that has low nutrition level can’t help much, but if necessary during drought the cows will eat it. We will still make an effort so the heifers can consume quality feed,” he explained. As for the water supply, the regional government assisted them by building a dam. Nevertheless, it would be better if there is a water pipe that goes to every grazing area, with water reservoirs. At the moment, they provide water container made of barrels for the cows. “We also haven’t made grazing rotation. Currently, during the dry season, what we do is let the cow to graze in a 15 hectare area per day. But during the rainy season, grazing cows in such a large area can take 2-3 days because of abundant grass,” Akhmad explained. For the intensive cattle breeding pattern at KPT Maju Sejahtera, the cows are placed in a communal shed. There are 4 cowsheds in 4 farmers’ group. They feed the cows with 20 percent concentrate and 80 percent green feed in the intensive system breeding management. “For this kind of pattern, the production cost can reach Rp 11,000 per female per day and weaner calf at Rp 6,000-Rp 8,000 per calf per day,” said Suhadi. Other than semi-intensive and intensive breeding systems, a few private companies also do cattle breeding by integrating it with their palm plantation. PT Bio Nusantara Teknologi, for example, has a 6,000-hectare palm plantation in Bengkulu and the palm trees are aound 20-25 years old. Yulissa Fitrianis, the Deputy Head of Cattle Farming Development Project at PT Bionusantara Teknologi, said that palm and cow integration was initiated while they were preparing to replant the palm trees. Therefore, the company has to think of another business unit to survive during the time of low production because of that process. In addition to that, the pam and cow integration can make use of the solid waste from Crude Palm Oil (CPO) processing, which they use for cow feed. Yulissa stated that the concept is very applicable because of shared use of land, solid waste utilization and palm leaves are proved to be source of life for the cow colony for breeding. Another goal is to become a supplier of feeder cow which can meet the demand in the surrounding area, especially in South Sumatra, so that they can reduce the dependency on imported feeder cows and help the government to achieve national beef self-sufficiency. They use an area of 1,500 hectare in two districts for grazing in their cattle breeding program. Around 60 blocks are allocated for grazing, with each block ranging from 15 to 40 hectare. Grazing is done by rotation system for 90 days with cell movement every day or every other day, depending on the contour and width of the cell. The other area has not been allocated for grazing because it is still undergoing the replanting process (young trees under 5 years old), so the cows cannot go there. There are also another area that is too steep with more than 90 decree inclination that is impossible for grazing. In the beginning of their cattle breeding program, PT Bionusantara Teknologi also received BX cows—249 heifers and 13 bulls—from the IACCB program. After 18 months running the program, they managed to birth 130 calves with 80 percent pregnancy rate, and calving interval for the second calf at 13 months. Although only 1 has produced a second calf. “At the moment, we are still trying to increase the capacity in raising the calves to ensure low mortality rate,” exclaimed Yulissa. PT Superindo Utama Jaya, a cattle farm company in Lampung, is also running similar program by partnering with PT NAKAU.